Peter O’Malley, president of the Los Angeles Dodgers from 1970-98, privately built two baseball fields in Ireland, one for youth and one for adults. 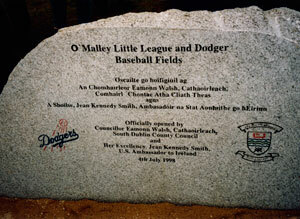 This is the official stone commemorating the opening of the O’Malley Little League and Dodger Baseball Fields in Corkagh Park, West Dublin, Ireland on July 4, 1998. The stone features writing in Irish Gaelic and English. The Peter O’Malley International Invitational Tournament will be held July 12-14. U.S. 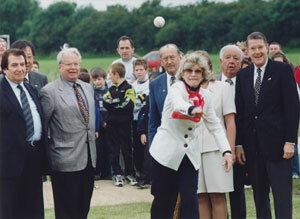 Ambassador Jean Kennedy Smith throws the first pitch at dedication ceremonies for the O’Malley Little League and Dodger Baseball Fields in Corkagh Park, West Dublin, Ireland. Peter O’Malley (far right), president of the Los Angeles Dodgers from 1970-98, privately built the two fields, opened July 4, 1998, which serve as the centerpiece of baseball in Ireland. From L-R: Aldo Notari0, President of International Baseball Federation; Dr. Creighton Hale, President, Little League Baseball; Ed Piszek, Little League Foundation Trustee; Ambassador Smith; Rod Dedeaux, legendary head baseball coach at USC; and O’Malley. The first Peter O’Malley International Invitational Baseball Tournament will be played this week at Corkagh Demesne Park in Clondalkin, West Dublin, Ireland from July 12-14. Named for O’Malley, president of the Los Angeles Dodgers from 1970-1998, the four-team tournament features the host Irish National Baseball Team, Rota Blue Devils, representing the United States Navy, British Baseball League entrant Liverpool Trojans and Los Barbaros, a team comprised of international players who have traveled from all over the world to compete. The tournament is Baseball Ireland’s contribution to “The Gathering Ireland 2013,” a year-long celebration of all things Irish – culture, tradition, business, sport and fun. Three games will be played on Friday, July 12, three games on Saturday, July 13, with the third-place and championship games set for Sunday, July 14. The international tournament is named for O’Malley, who is a friend and significant contributor to the success of baseball in Ireland, according to Mike Kindle, president of Baseball Ireland. O’Malley had previously privately built fields in two countries – “Dodger Baseball Field” in Tianjin, People’s Republic of China in 1986 and “Dodger Little League Friendship Field” in Managua, Nicaragua in 1992. He also privately built what was considered a leader in the field, a state-of-the-art baseball academy “Campo Las Palmas” near Santo Domingo in the Dominican Republic. O’Malley’s first meeting with the Irish Baseball and Softball Association (which was founded in 1989) was in 1994, with the goal of getting more people involved with the game. By July 4, 1998, two fields built strictly for baseball were dedicated at Corkagh Park – a regulation-sized adult field (Dodger Baseball Field) and an international standard Little League field (O’Malley Little League Field), which serve as the centerpiece of baseball in Ireland and have been used continuously for adult and youth regular season and international games. United States Ambassador Jean Kennedy Smith threw the ceremonial first pitch during opening ceremonies. Peter O’Malley is a fifth generation Irish-American. His father Walter O’Malley, former owner of the Dodgers who was inducted into the Baseball Hall of Fame in 2008, has bloodlines that can be traced to famed County Mayo, Ireland on his father’s side. Walter’s great grandfather John O’Malley and his wife Margaret Collins were born in Ireland (John in County Mayo) before immigrating to the United States, where they met and married. The O’Malley name goes back to the famous “Pirate Queen” Grace O’Malley who lived during the 16th century. 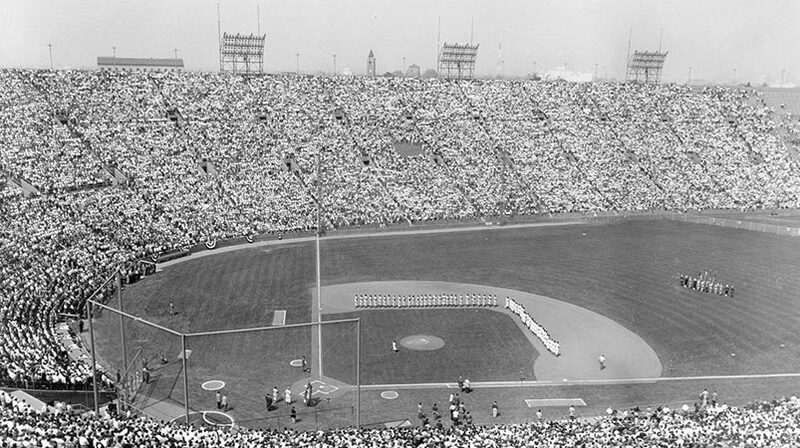 With great respect for Irish traditions, Walter started hosting St. Patrick’s Day celebrations in 1951, his first spring training as Dodger president. The parties at Dodgertown, Vero Beach, Florida, which continued to grow when Peter became Dodger president in 1970, became legendary in baseball lore. Earlier this year, O’Malley was inducted into the Irish-American Baseball Hall of Fame in New York and received the Medallion of Merit from the Friendly Sons of St. Patrick, Los Angeles.